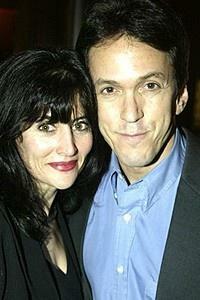 Tuesdays With Morrie author Mitch Albom (right) with proud wife Janine Sabino. Tuesdays With Morrie has already proven to be an international bestseller, so why not give the old guy a shot in showbiz? Yes, Mitch Albom's touching account of a relationship between a young man and his dying former professor, opened off-Broadway on a recent Tuesday (November 19) at the Minetta Lane in Greenwich Village. After the standing o, director David Esbjornson (The Goat) and the cast of the two-hanky show celebrated their good fortune at an opening night bash at America.